Local government parks staff can reduce their liability risks by implementing proper maintenance policies and procedures. Gain an overview of the law on occupier’s liability, as well as review the unique and unusual legal issues that parks departments face. 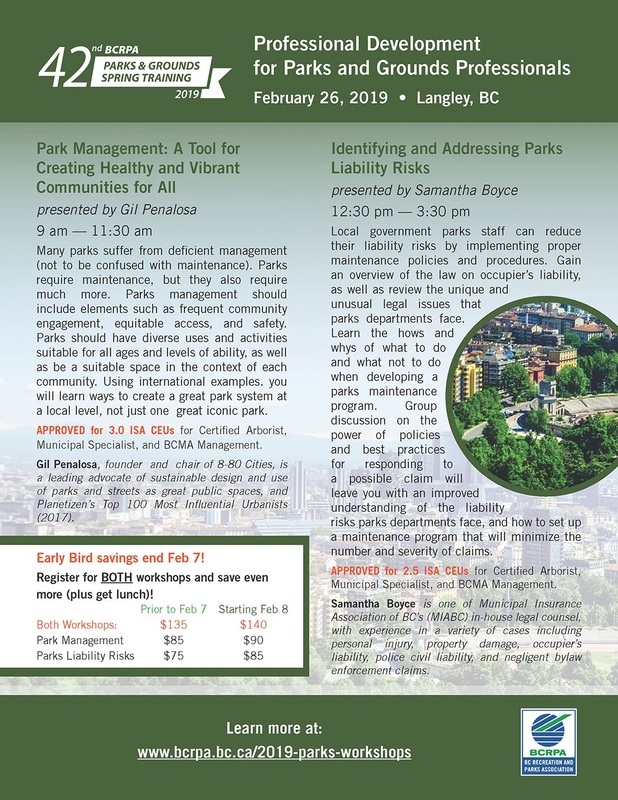 Learn the hows and whys of what to do and what not to do when developing a parks maintenance program. Group discussion on the power of policies and best practices for responding to a possible claim will leave you with an improved understanding of the liability risks parks departments face, and how to set up a maintenance program that will minimize the number and severity of claims. Speaker, Samantha Boyce, is one of the Municipal Insurance Association of BC’s (MIABC) in-house legal counsel. She has an undergraduate degree from Queens University and is a graduate of the University of Calgary Faculty of Law. She was called to the BC bar in 2015 after completing her articles at Alexander Holburn Beaudin + Lang LLP. Samantha represents MIABC members in a variety of cases including personal injury, property damage, occupiers’ liability, police civil liability, and negligent bylaw enforcement claims. Samantha has trial and appellate experience in the British Columbia Supreme Court and the British Columbia Provincial Court.